The Capital District Transportation Committee (CDTC) is the designated Metropolitan Planning Organization (MPO) for the Albany-Schenectady-Troy and Saratoga Springs metropolitan areas. 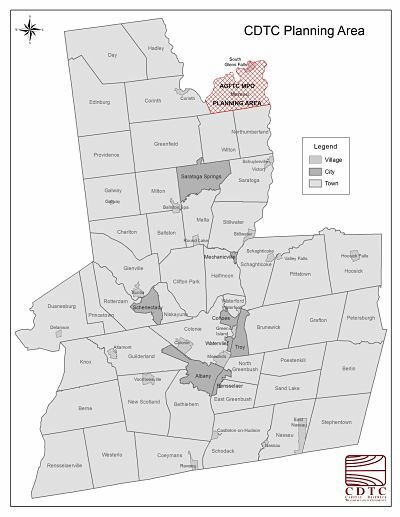 CDTC covers Albany, Rensselaer, Saratoga (except Moreau and South Glens Falls) and Schenectady counties. CDTC is a forum for local elected officials and transportation representatives to share ideas and make decisions about major transportation capital investments. CDTC is required by federal law and supported with federal funding. Federal transportation funding is controlled by the consensus decisions of CDTC -- about $100 million per year through the Transportation Improvement Program. CDTC's decision making body is the Policy Board. The Planning Committee serves as the technical committee to the Policy Board. CDTC's staff provides technical assistance to the Planning Committee and the Policy Board for informed decision making. Staff activities are listed in the Unified Planning Work Program. CDTC's priorities are guided by the Regional Transportation Plan, known as New Visions 2040. CDTC has enjoyed a high degree of local success and national recognition due to a highly-collaborative environment of mutual trust and respect. For more information about CDTC, explore a brief brochure or read a more detailed Reference Guide to CDTC. For a full understanding of how CDTC operates, read CDTC's Operations Plan or contact us.